The pillow is finished. It measures about 14×14 in, and of course, all my pillow inserts are either smaller or way bigger. So only a “flat” picture. The linen I used is not really great for a project like this. Is is very soft and a little stretchy. Very tricky to quilt. But overall I am satisfied how this turned out. By the way, it has an envelope opening in the back. I prefer them to any kind of zippers or buttons – the less hardware the better. I call this the Pink Quilt. Very imaginative, I know! Here it is, all finished. I have to say I am very happy how it turned out, and I am very happy that I decided on a smaller project. To warm up. A little clseup of the fabrics. 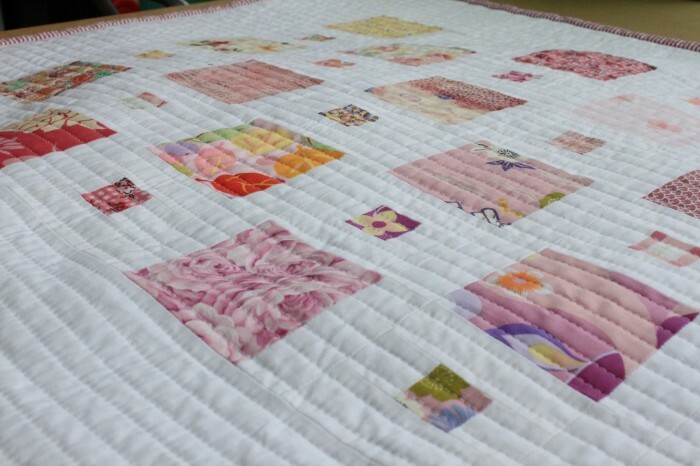 The larger squares are all diferent fabrics, some quilting fabrics, some fashion fabrics that are either thinner or heavier than the typical quilting fabrics. Two also has some stretch to them, but this is patchwork, any fabrics will do. That’s the idea, right? The white fabrics is upcycled sheet that thad just the right weight – I added a 4in border all around – gives the pattern a bit more focus, I think. As I mentioned in a previous post, I had some challenges keeping the seam at 1/4in, so my squares are actually a bit smaller than 3×3 in, so the quilt measures roughly 26×26 in. The back is a simple red checkered fabric. And, of course, the “folded” picture. Now a dillema: I have many squares left from this project, as I scaled back. Do I start another “pink” project or cut some more fabrics. Maybe something blue this time? 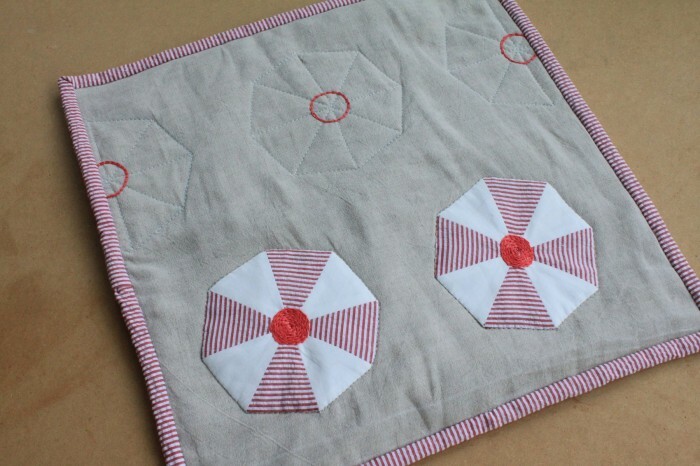 I also found this quilt on Pinterest. It is beautiful in its simplicity. I may have to make this one. Thanks for the inspiration. Would love to see a tutorial on it. when looking at it I thought you had simply boxed the small square in with white strips but looking close I can see no evidence of lines there. very pretty. 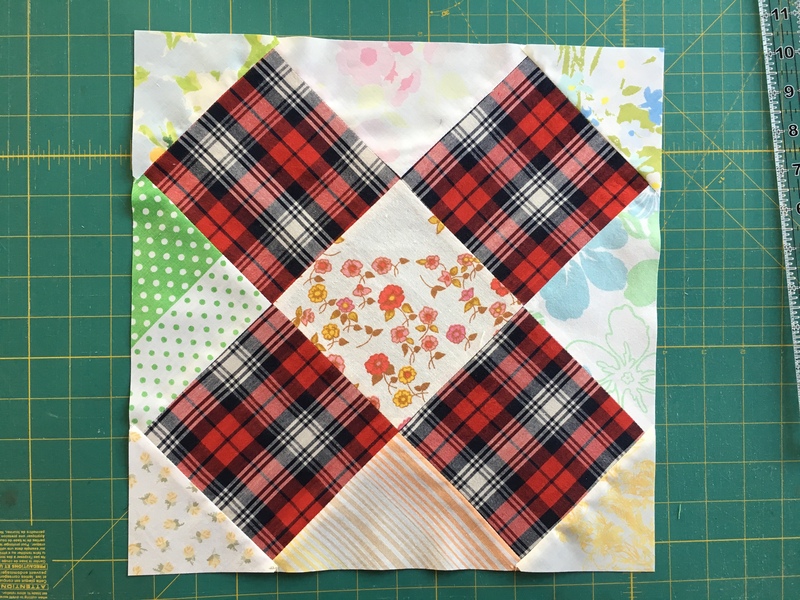 I am working on a new quilt using the same pattern and then I will post a tutorial. But yer, Linda you are right, the smaller squares are boxed in with white strips. The lines are hard to see possibly because I iron open seam (if I can) which makes seams flat and hard to see. I would like the pattern to the pink quilt? Can ypu please send it to me? Thank you.